The first Learjet 28 Longhorn (Serial Number 28-001) cruised at 50,000 feet somewhere between Allentown, Pa., and Mattoon, Ill., when the thought hit me. The late Neil Armstrong, the first man to walk on the moon, had flown this same airplane and here I was riding in the cabin. It was on Feb. 19 and 20, 1979, when Armstrong, then a professor at the University of Cincinnati College of Engineering (and a member of the Gates Learjet board of directors) and Learjet test pilot Pete Reynolds set five Fédération Aéronautique Internationale and National Aeronautic Association class records, while flying 28-001, then a Learjet prototype. Two of the records (for altitude and sustained altitude in horizontal flight) were set on a flight from Wichita to Elizabeth City, N.J., while the speedy prototype jet cruised at 15,534.6 meters (51,130.577 feet). I’ve been in other places where famous men and women have been. I’ve slept in a house where George Washington slept, overnighted in a tent on the Gettysburg battlefield, touched the clear plastic protecting John Glenn’s Friendship Seven in the National Air and Space Museum, and quietly walked the Via Dolorosa in Jerusalem. But the experience in that Learjet 28 at 50,000 feet was somehow more personal. 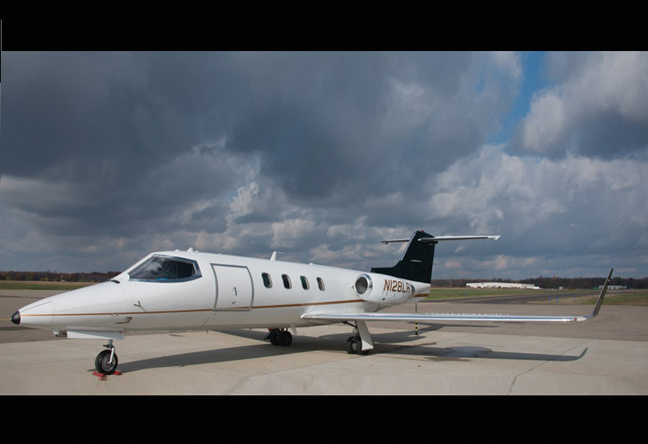 See more photos of the Learjet 28 here. In the cockpit of the 28 (N128LR) sat two professional, Part 135 pilots, Jim Dinan and Matt Dietz. Phil Burkert, chief of maintenance, sat in the front-left passenger seat, his feet stretched out on the Learjet’s closed, airstair door. All work for LR Services, a privately owned charter/management company based at Lehigh Valley International Airport in Allentown, Pa. We were en route to Wichita to display 28-001 at Bombardier’s “Learjet 50 Years of Flight” event celebrating the 50th anniversary of the first flight of the first Learjet, the 23, on Oct. 7, 1963. Burkert gave me a handout about the 28’s record flights. The crew planned to offer the flyer to current and former Learjet employees, their families and other invited guests at the event. In it is a photo of Armstrong and Reynolds in the small cockpit of the turbojet-powered airplane, their shoulders nearly touching and bright sunlight washing out part of the instrument panel. From my position in the cabin, Dinan and Dietz did not look much different from Armstrong and Reynolds, and many of the “steam-gauge instruments” still on the panel are the same as those in the photo. It was easy for me to imagine Neil and Pete flying the jet during their record-breaking flight going the opposite direction. “Neil Armstrong walked on the moon,” I said in an unnecessarily hushed voice. I remembered watching that historic event on a black-and-white TV with my father, who, like Armstrong, was a former Naval aviator. Armstrong had made history again in this Learjet 28. And here I was, seemingly by coincidence, in the same airplane, almost at the same altitude, and (I imagined) possibly in the same airspace. I felt simultaneously privileged and humbled. LR Services manages 28-001 for its owner, who until 2010 allowed it to be chartered. But when fuel prices became so high that the 28’s operating costs raised the break-even charter rate above what the market would bear, the owner instructed LR to park the airplane. Compared with modern turbofan engines, turbojets burn fuel prodigiously, especially at lower altitudes, and the 28’s General Electric CJ610-8As are no different, burning about 1,400 pounds per hour whether at altitude or on the runway. The 28’s range is measured better in time, and two hours of endurance is a comfortable ballpark number for flight-planning purposes, according to Dinan. But how the airplane climbs! On the return flight out of Wichita we climbed through 15,000 feet just five minutes after takeoff, by my reckoning. The chart gave takeoff distance as 3,144 feet. And the 28 is a speedy Mach 0.81-max airplane. Its service ceiling is 51,000 feet. Max takeoff weight is 15,300 pounds. Meanwhile, the owner still has the option of selling the airplane, perhaps to a collector, or having it approved for airshow use only. He’ll need to do something, unless he wants to park it permanently again, because come Jan. 1, 2016, the 28 (a Stage 2 aircraft) will be banned from flying in the contiguous U.S. Another option would be to add noise suppressors to the engines, such as those offered by Avcon Industries for the 20-series Learjets. Burkert told me that after the owner parked the airplane he took care of the calendar-based checks for the first year, but then let them lapse. The main expense was replacing dead batteries in the emergency lights, and it seemed pointless to buy new batteries when the airplane wasn’t flying. Burkert said he did power up the ship and run the engines about once a month. Now it was time to start catching up on the maintenance. At some point, Learjet contacted LR about bringing the airplane to Wichita for the 50th-anniversary event. Only five 28s were built, and the one at LR Services was the only one available. The owner agreed and Burkert now had himself a deadline. He did all the A through D checks, as well as the next hour-based check (28-001, which was built in 1979, has logged about 8,400 flight hours). As it turned out, the only unscheduled work involved fixing a minor fuel leak in the left wing and a small hydraulic leak. As it turned out, the Learjet 28 was one of the biggest attractions at the 50-year anniversary event. Many folks were drawn to the unfamiliar 20-series model, which was the world’s first production aircraft with winglets, and surprised by its history with Neil Armstrong. But a bigger draw was perhaps the airplane’s fully opened airstair door and the fact that the crew allowed visitors to climb into the cabin. Of all the Learjets and Challengers and Globals on display (admittedly many were test airplanes and others in assembly), the only other jet with its door open for walk-ins was a Learjet 40 operated by Flexjet. While headwinds on our flight to Wichita on Sunday necessitated a fuel stop, which we made a bit over halfway at Coles County Memorial Airport near Mattoon, the return flight to KABE was nonstop. Dietz, who captained the leg, hand-flew a dogleg intercept to the ILS for Runway 24 in cloud, breaking out at 900 feet bang on the localizer and glideslope. No one was around as we parked under misty skies outside the LR Services hangar. No longer a celebrity, 28-001 looked like any other business jet on a ramp anywhere in the world. But we know this Longhorn is special. Course: Wichita, Kan., to Elisabeth City, N.C. Course: Elisabeth City, N.C. to Florence, Ky. Note: The airplane’s tail number at the time of these flights was N9RS. All of these records were ratified by the FAI but have been superseded since their approvals. Randy, I really enjoyed your story on the Learjet 28. As the 32-year-old project manager (non-flying logistics, hotel reservations, press releases, etc.) for the the time-to-climb record flight from First Flight at the time, the article tugged at my youthful memories. We flew three Learjets to First Flight to make this happen (I even still have the video we made of the event -- me and Neil Armstrong in the same movie!) I remember Neil (he had just walked on the moon 10 years before) was a real soft-spoken gentlemen and intently interested in the records from an engineering perspective (since he was on the Learjet Board at the time I logged a number of fights with him to and from board and annual meetings). Imagine young Jim Gregory with Neil Armstrong, Pete Reynolds and Harry Combs on a world record setting project. Actually Harry wanted to fire me on this trip because I wouldn't say in my press release that it was a time to climb record to 51,000 feet vs 15,000 meters but Jim Greenwood intervened and saved my job and probably my career. While there Harry and Armstrong worked on a video to promote Harry's book "Kill Devil Hill," which was another for the record-setting flight as Harry couldn't get Neil to do the trip for book promotion alone. Not long after that, I took a press demo flight at night at 51,000 feet where we saw from the cabin and all at one time -- curvature of the earth, sunset, the terminator where the light meets the dark, aurora borealis, full moon rising, thunderstorms over New Jersey, and the Milky Way unfiltered by 51,000 feet of atmosphere. Wow! I found fascinating the article First Lear 28 Still Awesome in the December 2013 issue because I manage and regularly fly two Lear 28s. Serial number LJ-28-003 (N800GA) and LJ-28-005 (N500LG) are also awesome aircraft. After Armstrong set the original records in 1979, William and Betsy Benton set new records in 1988 in -005 N500LG, which was the record holder for two world records according to the World and United States Aviation and Space Records and Annual Report FAI dated 1991. N500LG was the last Lear 28 to hold the record until Michael Melvill set a new record in 2000 in a Scaled Composites Model 281 Proteus. I am in the aircraft repossession business and picked up Serial Number -005 in England fifteen years ago and am still flying it today for the owner. Also, Serial Number -003 came in to my possession 11 years ago and I have been flying both regularly since their acquisition. Total time for me in all Lear 28s is over 5,000 hours. Learjet gave out “510” pins (representing Flight Level 510) and I have accumulated several of these pins over the years. It’s a shame these two very special aircraft (especially the current record holder N500LG) were not in attendance in Wichita at the Learjet 50-year anniversary. It would have been a pleasure for both aircraft to attend. In the past, I have flown Serial Number -004 currently located in Washington state and feel certain I could have arranged its attendance as well. Serial Number -002 is based in Toluca Mexico and still flies for the Mexican government. Thank you so much for recognizing an awesome aircraft and featuring it in your publication.